If you were planning on spending a day outdoors, then a good quality speaker is a must have. It needs to be weatherproof, waterproof and be able to connect easily to your mobile devices. Well, the URPOWER IPX7 offers exactly those capabilities at an extremely affordable price. 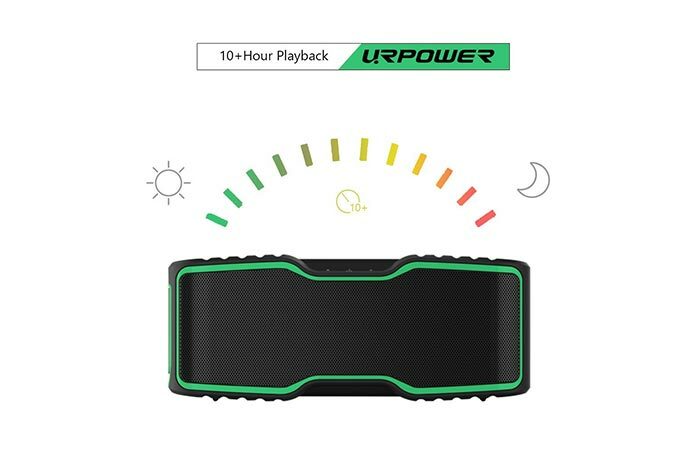 Waterproof, Bluetooth and NFC connectivity, and, of course, brilliant sound quality, the URPOWER has exactly what you need. Apart from being completely weatherproof, the URPOWER IPX7, also features crystal clear HD sound via the dual drivers and passive subwoofer. Starting off with the overall look, this speaker features an all-black design with groovy electric green lines that accentuate the curves and add class to the speaker itself. Furthermore, with an IPX7 rating you can rest assured that this speaker is completely waterproof, dustproof, shockproof and was engineered to handle harsh environments. 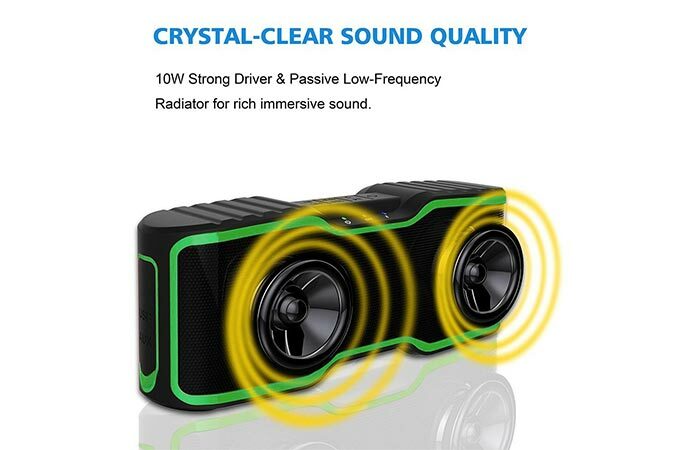 Since it is completely waterproof, this speaker can be completely submerged but will stop playing because of the water pressure and will continue playing again once taken out of the water. 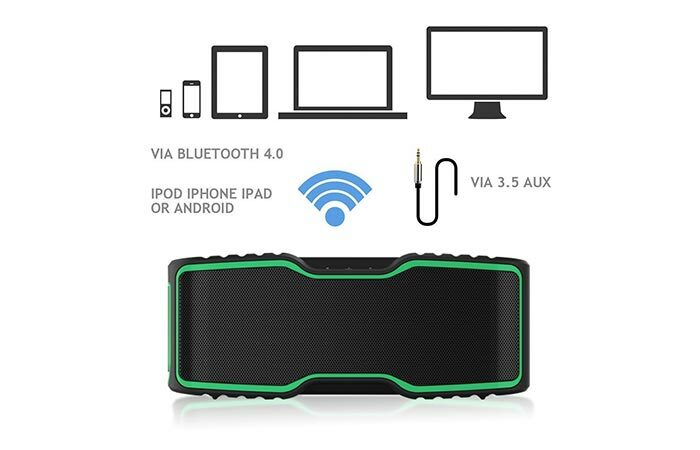 Connectivity has never been easier since this nifty speaker features both Bluetooth 4.0, NFC and can be connected via the standard 3.5mm audio jack. The URPOWER features an insanely loud 10W speaker that allows for robust basses, enhanced trebles and sublime mid-ranges, since it was features HD sound via dual high-performance drivers and a passive subwoofer. Connectivity has never been easier because this speaker features the latest Bluetooth version 4.0 and has a range of up to 33 feet. If you have an NFC activated device, you can simply connect via a tap. Apart from all the major features that the URPOWER IPX7 has to offer, it also delivers an astounding 10 hour playback time per single charge. To top it all off, the URPOWER IPX7 can also accept calls via the built-in mic, can be set in 4 different languages and has an impressive 10-hour playback time. 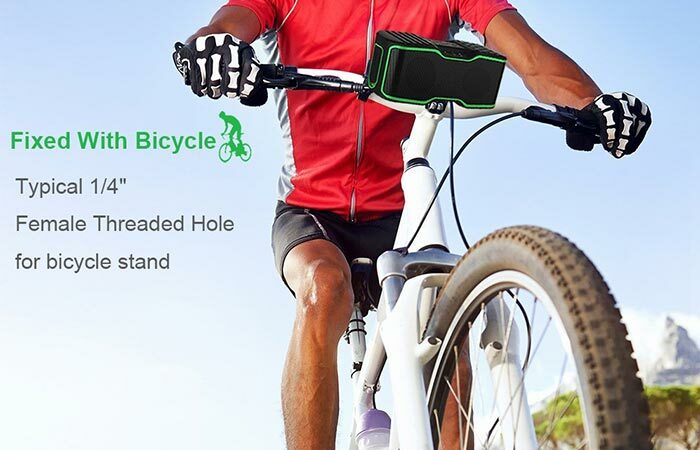 Impressively, this speaker can even be attached to a bicycle or tripod, via the built-in tripod attachment.